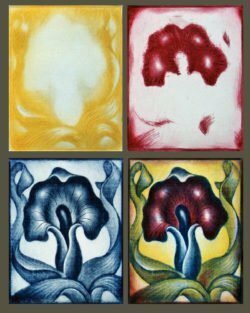 Join Carol Wax, mezzotint master and author of “The Mezzotint: History and Technique” in this non-traditional approach to non-acid etching. This workshop presents myriad methods for working in the mezzotint manner that don’t entail use of acids, solvents, or rocking plates. Participants will learn how to use a variety of hand tools to create tonal images on copper plates. Instruction includes use of carborundum, drypoint, and roulettes to create grounds for rendering images deductively, as well as additive techniques for infusing prints with fine details, textures, and other effects. Demonstrations and individual attention will be particularly useful to artists who tend to pull highlights and push shadows, and printmakers who want more spontaneous tonal approaches for making new imagery or developing previously etched plates. Approaches to color printing are also addressed. Beginners welcome.